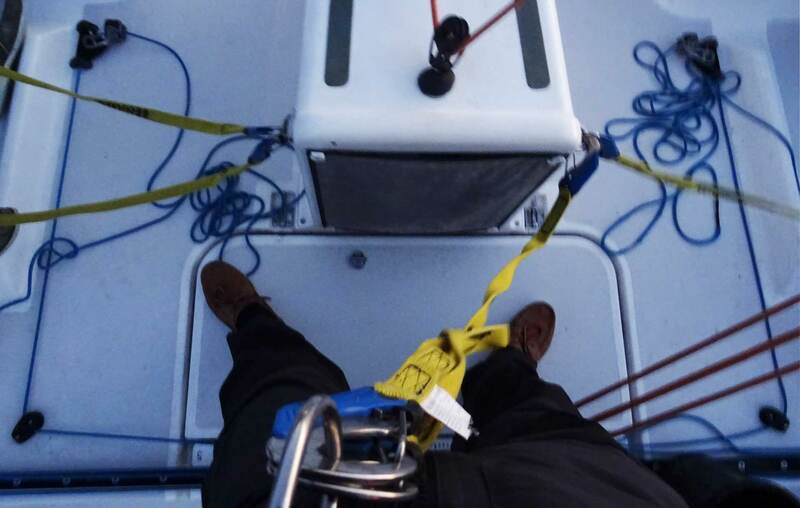 After coping with my own first ever bad weather sailing situation (read about it here and here)I am now in a position sum up my experiences and to filter the most important learnings. I know that this article in no way can claim the status of being a complete guide as sailing is a very complex thing and a sailor – this is what I understand and really believe – is to get re-assured and rounding up his experiences by an ever growing set of experiences. As I was telling to my sailing mate after the trip – which is still valid now: This foul weather sailing trip was teaching me more than all thousands of miles under sails before. This article is about mastering foul weather situations. And here´s my first advice and learning: A good seafarer avoids foul weather. He is interested in sparing his boat, his crew and his guests from the experiences and stresses connected with foul weather. His primary objective should always be the safety of ship and men aboard and unless you are on a scientific vessel or a training boat going out on to teach a bad weather class, you should try to avoid foul weather situations as best as you can. 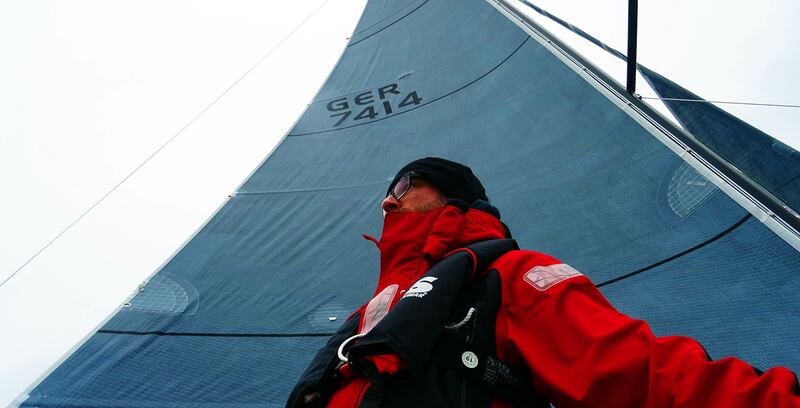 If you can´t, here´s what I´ve learned from four days of sailing in bad weather. Know your boat. Inside out. First thing for the skipper is to know your boat inside out. It applies not just to but very much for bad weather situations. You have to know where everything is located, find your way blindfolded through the boat to be able to react in case something happens. Check your boat´s equipment thoroughly – especially when you charter a yacht – and do it very, very scrupulous! We didn´t do it very good in the first place and had to realize that the line of the second reef hadn´t been attached to the main sail in the first place: Poking up and down in the waves with flying sheets this wasn´t a good place nor a good time to having checked the lines. Is the depth sounder calibrated to show “depth under keel”? This can be a crucial thing – because if the sea bottom comes nearer and you have no clue and you aren´t so sure about that, it can and it will get very, very crazy on board. And dangerous. Do you have sufficient lighting on board? We realized that neither the mast had a deck light (it was a performance-rigged racing version) nor wasn´t there a searchlight. Landing in pitch dark blackness in the midst of a rain shower shouldn´t be a lottery! Rig the boat for a storm and make sure down below is everything secured: Even small waves can batter the boat hard and throw things like nothing through the cabin. Which makes it necessary to clean the whole boat at best – and can be dangerously hurting the crew at worst. Last not least, rig your crew: Tell them what you expect is going to happen, how long this will take and what your strategy will be. Knowing is a blessing and the best cure against fear. When I board a yacht to set out for a sailing trip that will last more than one day it is a custom thing for me to have my full foul weather gear stashed into the duffel bag as well. Even in the midst of a hot summer there can be bad weather like heavy downpour and even thunderstorms or larger depressions occurring: Especially when weather pattern get more and more crazy in the course of global weather changes. Having the right clothing is not just a matter of safety but also a matter of motivation: Staying dry and warm when weather gets crazy will keep your mood up high. Staying dry is a must! Do not save money on your foul weather gear. I know that good offshore clothing with multi-layered Goretex and other fancy high tech fabrics is a pure drain to your wallet, but it is definitely worth it! We have now been out in cold, windy rain showers in the Beneteau First 30 for three days in a row and I can assure you that the biggest factor for me of keeping my spirits high was the fact that this weather couldn´t attack my wellbeing as my clothing protected me very nicely from pretty much everything the weather threw at me. A good jacket and trousers sum up to at least 800 Euros, I very much like the Offshore 2-collection by Gill Marine. 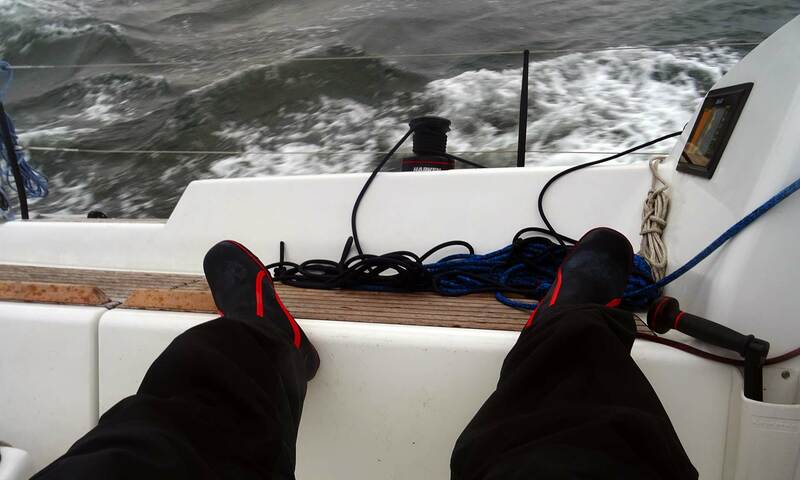 My sailing boots had been a complete disaster, they broke down and ripped open, my feet got icy cold and wet. I will replace them of course. Not solved is the mystery of keeping one´s hands dry as all of my three pairs of gloves from racebike-gloves to winter-gloves to neoprene-gloves couldn´t keep my hands dry and warm. I´m still searching here. Thanks Amanda for the hint to acquire waterproof socks, this will be my next product test. As I stated earlier a good skipper should avoid bad weather situations. This is done by constant monitoring of the current weather situation around the boat and of the general weather systems at work in your respective larger sailing area. Understanding the weather and keeping track of the changes is much more important when foul weather cannot be avoided anymore. I think that there are generally speaking two kinds of weather knowledge applicable: The general and the local weather situation. General weather is the weather that happens in a larger scale. High pressure and low pressure systems, their trajectories and general patterns of winds. Approaching weather fronts, disturbances like trough constellations or other phenomena. Usually the general weather spans an area of the whole North Atlantic Ocean, when you are planning a crossing or the Western Appraches including Europe when you are sailing in the Baltic Sea, like we did. It´s the whole picture and your own forecast you draw from it that gives you hints about the general dynamics of the coming weather to be expected. Local weather is the pattern to be expected in the vicinity of your yacht. 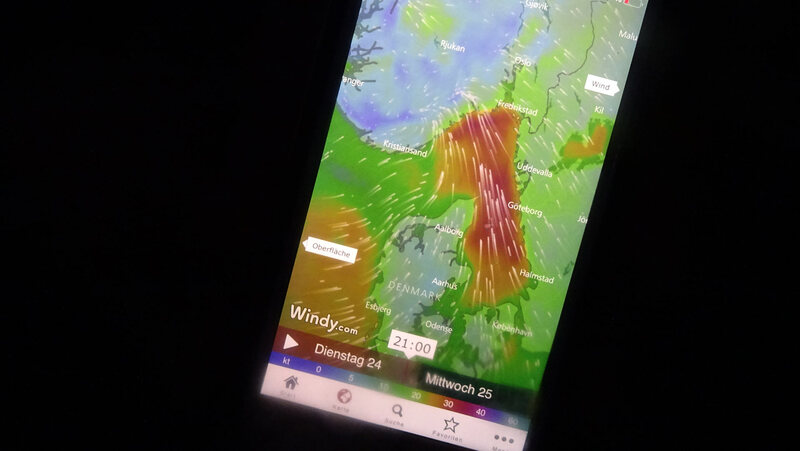 Usually forecasts nowadays are very accurate although we´ve made the experience that the coming or not-coming of particular changes might be late or early two or three hours to the forecast – so do not rely solely on the forecast! A weather forecast is solid if valid for the coming 24 hours. Everything that is forecasted to a longer period of time looses accuracy and thus cannot be trusted completely. This in mind a good skipper will check regularly, at least every 2 hours and will keep a written track of the weather forecasts. Which load can take your rig? Know your boat! If you are on a long haul passage away from the trade winds and barefoot route you should invest in satellite equipment (all in all not more than 5.000 Euros) to acquire latest weather forecasts. It´s just a matter of safety and you don´t save money on safety. Have at least classic sailing directions and weather statistics as books aboard because those records are a good hint for general weather in your respective region including the occurring currents. Last not least, before casting off I think it is customary for a skipper in being to learn about how weather works and which forms of weather there are. It´s not a spare time delight to impress a lady on a date knowing the names of clouds but a necessary knowledge to know what a particular cloud means for the weather to change soon. What is fetch and what does this mean in reality? Get a class to acquire the knowledge in the first place. Also the lecture of books about this particular topic (LINK) is very helpful. I know that in the age of effortless push-button-sailing and fancy touchscreen chart plotters the good old fashioned nautical chart as a paper might be considered by a lot of sailors as outdated. But it is definitely not. No matter how advanced the technical equipment aboard your yacht may be, electronics can and will fail. 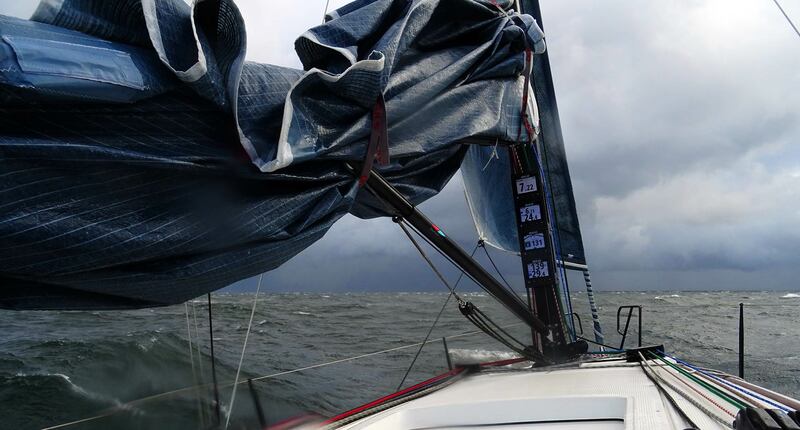 During our trip with the Beneteau First 30 we had the regular problem that during the rainy downpour the plotters seemed to have crashed: Screen frozen, no chance whatsoever for restart. We were lucky that the boat was equipped with two plotters, but one of them was off duty virtually the whole time. Not good. So transferring your actual position onto a paper chart every two hours is a must. But there´s another fact to be considered, and believe me, I had to learn it the hard way. 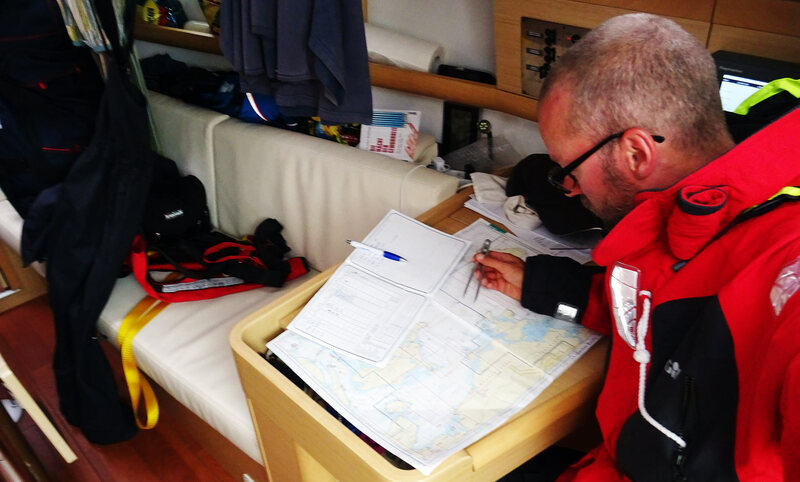 By navigating on paper charts as well, the skipper gets a full picture of the seas ahead. You automatically get a feeling for buoys, fairways, cliffs and shoals. Not so with the plotter: I missed a 1.80 m shoal by 200 metres due to my failure of navigating with paper charts and relying solely on staring at a zoomed electronic plotter. Catastrophe was immanent and the danger was very, very real! 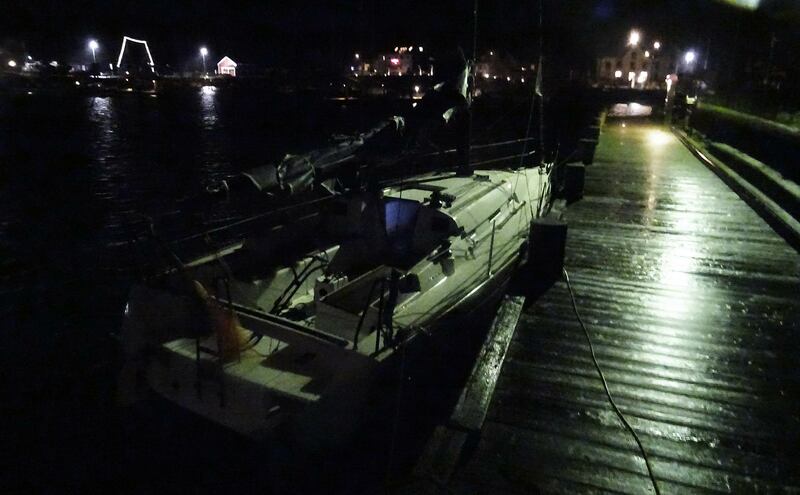 Imagine running aground in foul weather with stormy waves … you just don´t want to risk this! That was dangerous. Safely moored at last! It´s just a matter of good seamanship that your yacht is fitted with latest charts and harbour guides. Those books deliver valuable information about approaching a port, possible currents and other local specialties which a chart plotter just does not deliver. Again, a skipper entering an unknown marina in the midst of strong gusty winds and heavy rain just cannot afford to cruise around and look for what this particular harbour is all about. You will want to know for sure the situation at the scene upon entering. It´s also a matter of safety here. Again, those books are also a source of possible refuge harbours in case you have to change plans and seek shelter in a different port as previously thought. Going down to do chartworks, the log and reading passages in the books is something a good skipper should do – no matter of how seasick he might get in heavy swell. Stay safe. Stay safe. Stay safe. Swell, 25 knots wind: Time for the Lifebelts! When heavy swell is beginning to rock the boat hard people in the cockpit must attach the harness as a measure of last resort. The life jacket may keep you alive in a case of MOB, but only the lifebelt will keep you safely attached to the boat. 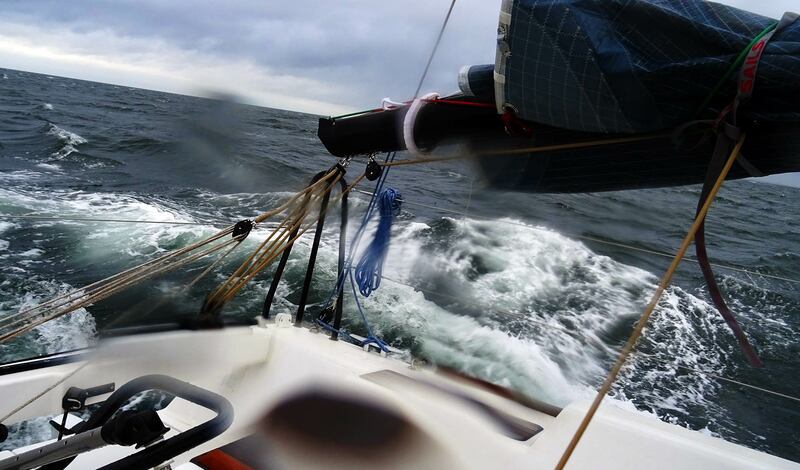 I have experienced it by myself how the power of a sudden gust or one singly mighty wave can and will cause a broaching of the boat – sometimes there´s just no chance to grab a handle to hold tight. The lifebelt is called lifebelt not without a reason … Best in storm is to have two persons up in the cockpit, the rest should stay down below and get wedged in the saloon near the center of mass of the boat (around the keel) where the effect of the rocking is less harmful to the stomachs. If you are up alone, report down for being alive regularly. Even when it is not exactly a storm the psychic and more over the physical strain put on your body will be enormous. 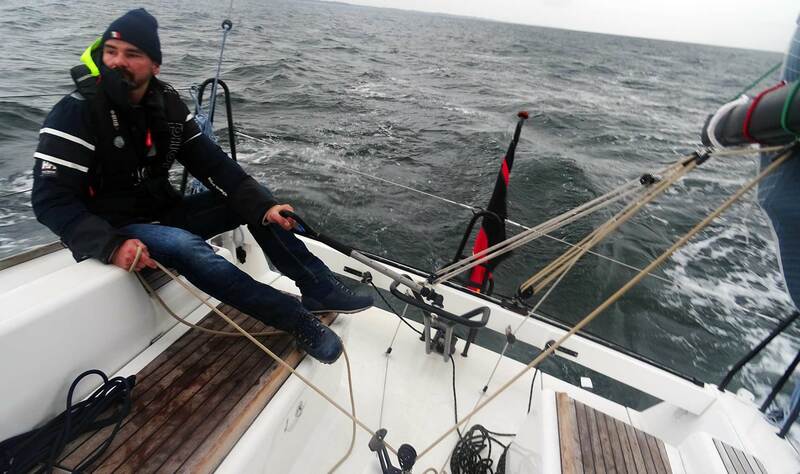 At some point the automatic steering system won´t manage to cope with the swell and you will have to helm by hand. 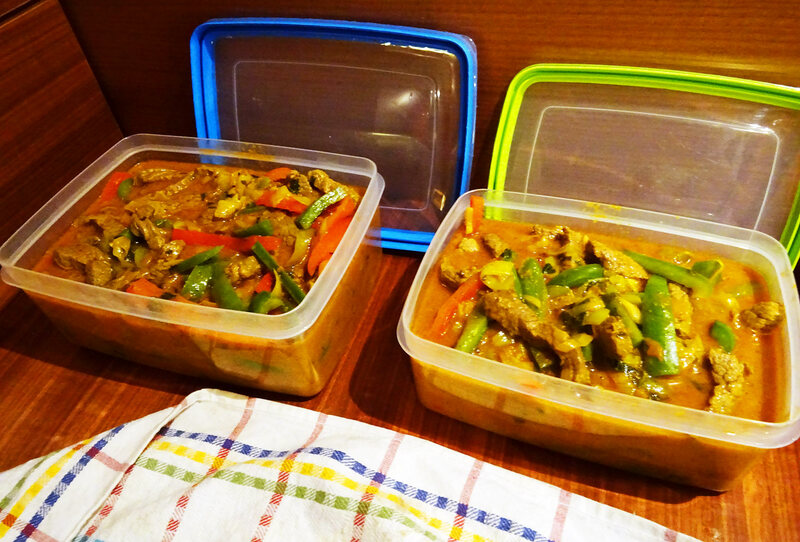 If this is done a couple of hours both the needed concentration as well as the muscular strain will eat away the energy of your body – in short: You need to replenish this energy by eating and drinking. First thing is to limit watch time to one or max two hours because staying awake and alert to react quickly in steering the boat safely needs a woke up mind and a strong body. If your crew size allows, have two people in the cockpit at one time so that the helmsman can solely concentrate on steering the boat and the other will do the navigation, the lookout, the warning for waves and a cheer-up-guy for the morale. Down below the off-watch crewmembers should prepare for easy stuff to eat like sweets, chocolate bars, raw carrots, nuts, bananas or prepare some sandwiches. A cup of steaming hot tea – if swell allows – can be true paradise for a crew member up there in the freezing rain. This will keep spirits high and the crew alert to cope with the burden of running a boat through bad weather. Beware of dehydration: Even when it´s raining cats and dogs out there, eight or more hours can go by quickly and – me too – it´s easily forgotten to drink through such exceptional circumstances like a bad weather period. Dehydration can have a serious effect in the long term: It starts with a bad headache and can cause a crew member to complete break- and shutdown. I´ve once experienced serious dehydration when I was still racing bikes: It kicks you out of everything in a matter of moments and will set you K.O. for hours and days to come. Check for your crew members as well if they do drink enough over the day. 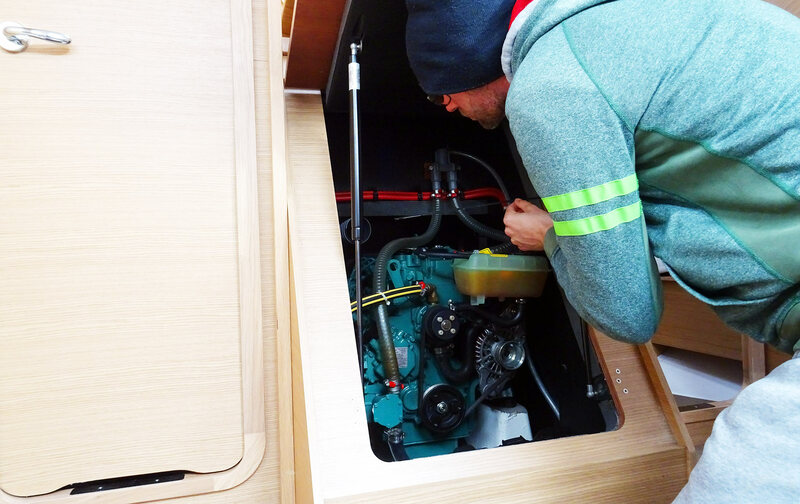 An early morning check-up of the technical readiness of your yacht should be a matter of course for every skipper. Enough coolant and oil in the engine? How much Diesel is still in the bunker? Drive belt firm and intact? Do the batteries – especially the engine starter – have enough power? If your engine won´t start during a critical situation, the lee shore can quickly become your final destination. Even if it´s “just” the landing maneuver in a harbour, the engine is your back up and your life insurance. Treat it as such. You should also regularly check the VHF for proper functioning and of course the navigational lights of your yacht. Check it well before dawn because in case lights don´t work you might be thankful for having done the check during daylight which will make it easier to replace a bulb or repair the stuff. Keep the boat tidy and rigged at all times. Don´t allow a mess to conquer your yacht because a messy boat is a potential source of injuries. You don´t want to break your cheekbone because of roping or dishes running about. Be reassured that in most cases your yacht can take a lot more than you think. And the yacht will survive situations even more hefty than the one you are in. But stay alert and avoid as much stress and strain for both the boat and her rig and for the crew as well. If you remain calm, your crew will adopt your attitude. If you always know what is going on, you come up with solutions (not with problems) and you transmit confidence, your crew will do the same. If you lose control, so will the rest of the crew do. Don´t forget, at some point there will be a climax in bad weather and then it will quickly change to become normal and nice again. There will be a calm after the storm. Try to visualize this and keep the spirits high. A joke can cheer up things. Talk of good stuff: A hot shower in the marina, a cold beer after landing the boat, even the prospect of a hot tea, a thick steak and of course a long good night´s sleep can motivate your crew. And yourself too. Don´t talk of catastrophe or things that can go wrong until it´s necessary to alert people. Don´t spread fear – spread trust and confidence. And when finally the storm is managed, waves go down and the sun comes out, allow yourself and your crew to relax. To calm down. To enjoy the success of the things they´ve achieved. Talk about what has happened and try to learn. Learn from each and every mile you sail, especially the hard ones will teach the most. Last but not least: Don´t fear the seas, but have respect. Respect the forces of nature and their unlimited powers – in relation to your very, very limited ones. A good sailor is a cautious sailor and one the first sentences of this article is still rule #1: Avoid bad weather if you can and spare you, your boat and your crew the stresses of sailing in foul weather. To get acquainted with such special circumstances, try and book a class with a sailing school during the rough months to get a foul weather training – it´s really worth it! Being up here now isn´t such a good idea: Get everyone down who is not needed. The ISAF-certification is still one of the certificates I consider customary for offshore sailors and that’s the next class I will take after accomplishing the German SSS-certificate (Skipper Offshore). Knowing what is to be done when everything goes wrong is something every skipper with discernment should call one of his skills. 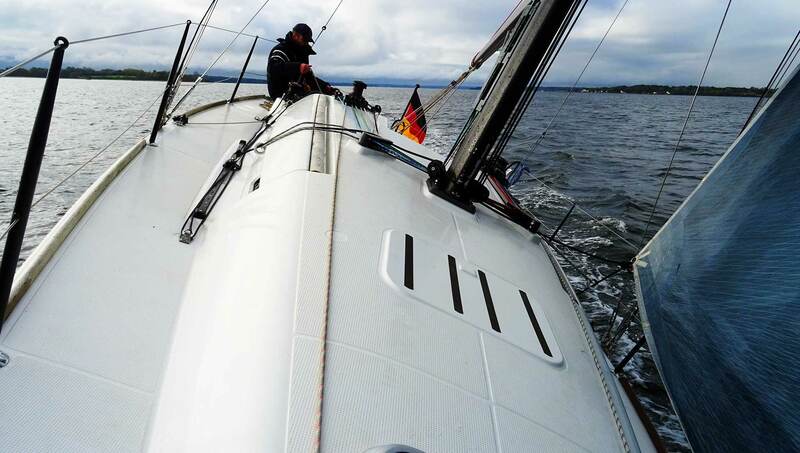 In the end, if you have the skills and the trust in you, your equipment and your yacht, why not go out and sail when it´s not that shiny sunny perfect summers day? A blowing Force 7 can bring fun – and the right helmsman training you need for when things should sometime turn out a lot more worse. Sir Isaac 288 Shark Bertie Boating Club, Point Abino, Lake Erie Ontario/Canada. Thanks Jutta & many greets to Canada.